Troubleshooting Disposals | Nor Cal Realty, Inc.
SAFETY FIRST: NEVER PUT YOUR HAND IN THE HOPPER (down the drain into the disposal)! If the breaker has not tripped and the reset button is not popped out, then it's either a faulty switch or a faulty garbage disposal. 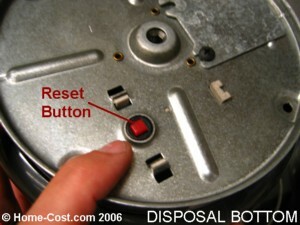 If after following these steps the disposal is still not working, call the office and submit a maintenance request. Your garbage disposer is a workhorse appliance in your kitchen and one often taken for granted. Your disposal will have no problem grinding most food waste, but that's not where the problems with a "clog" lies. Clogs are most often caused by how the ground food waste reacts to water or lack of water after the disposal unit has ground it up and sends it on its way into waste line. When a garbage disposer clogs you will often find the problem in the trap found on the waste discharge side of the disposal. Not putting enough water down the disposal when it's grinding is a sure way to get a clog. Over time the lack of flushing water does not carry the waste material fully through the drainage system and it builds up in the drain lines. These items may not seem like a problem but are a big problem. Grinding egg shells or coffee grounds will create very tiny granular waste that will stick to any sludge in the pipe and quickly create a clog. Potato peels are notorious clog makers. Once ground up they form a starchy paste similar to mashed potatoes and quickly clog the drain. Grinding Banana Peels. These are a similar problem to potato peels except they also add stringy fibers to the mix. The simplest way to avoid a clog is to make sure you flush the disposal with plenty of water when it is grinding and for 30 seconds afterward. Then occasionally maintain your disposal by regularly grinding up pieces of lemon peel and ice cubes. Follow these simple guidelines to keep your garbage disposal running well.